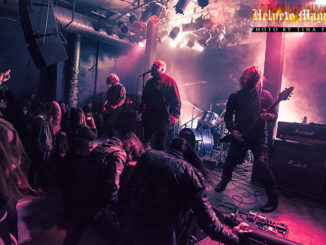 Midgarsblot has combined metal music and viking culture, and it is not easy to say if this is a metal festival with viking culture, or a viking festival with metal music, or maybe it just is a festival for vikings. But after three wonderful days one thing is for sure, metal heads and vikings are a great mix. The festival opened on Thursday with different viking activities and music. Just to walk around the beautiful area around the festival can be enough for one day. Just outside the camp you can go for a swim in the fjord, and if you get cold you can sit by the fire nearby that burned through the whole festival. Later this evening there were metal-DJ and concerts in Gildehallen, a beautiful viking house. Especially the last night when we got the only rain for the festival this building was very appreciated. 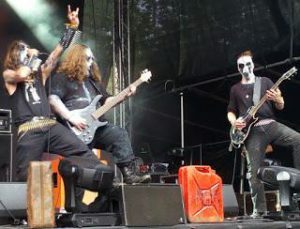 There has been different activities and music around the festival long before the first concert on the main stage, but with Trollfest the metal-part, and -party, of the festival commence. With violin, sax, accordion and up to three persons on drums and percussion this is party metal all the way. Personally I would have more sax. Almost the same as everyone else. But it is nice to finally see a band that got a saxophonist instead of having this part on backtracks. The band is high and low both on and off the stage in the sunshine, and some fun-facts about people getting out of the state church is well received. 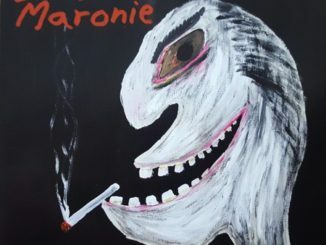 But if you manage to look and hear through the image, you hear that they actually got some nice bass lines and musical quality way beyond the image. 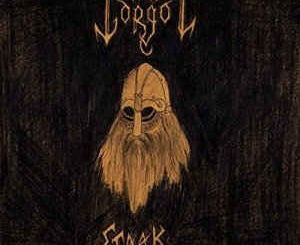 Folk-/viking metal band Skálmöld from Iceland is next, and this is music it is easy to like. Right before the show there was a viking battle right in front of the stage, so there is no time to get bored. And this is a perfect warm-up before the viking metal from Skálmöld. With rather catchy melodies and harmonies both the band and the audience seems to get rather much enjoyment out of the short set. The duo Inqusition from Colombia/USA gives us black metal before Enslaved from Bergen is ready with more extreme metal after a short break. 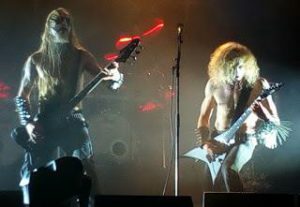 There is not much negative to write about Midgardsblot, but for those who wanted to see Enslaved from the beginning and got here when they were supposed to start missed 2-3 songs, something that of course is annoying. 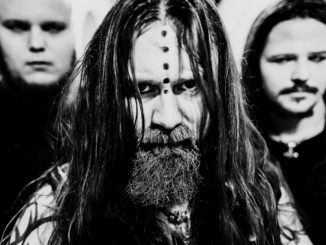 Even if Enslaved is rather extreme, they got melodic songs, and this is probably the reason that you can hear that the sound is a little muddy. But this is a great concert with a lot of energy, and when we get ISA as the last song we are satisfied even if we want more. Enslaved fits the festival’s image well, and actually some of the band members look like vikings even without a costume. Skuggsjá is the last band today, a band with members from both Enslaved and Wardruna. The use of folk instruments and the way the stage is decorated is perfect for a viking festival. And for those metal fans who think this is a too slow end for the evening there is entertainment and metal-DJ at Gildehallen. In wonderful sunshine three bands are finished before five o’clock. L.E.A.F. 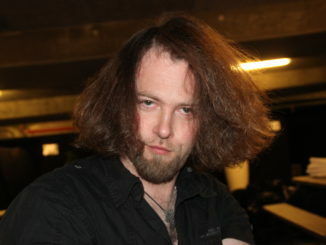 from the Netherlands was first out with medieval music on medieval instruments before a short set with viking metal from Blot from the south of Norway. 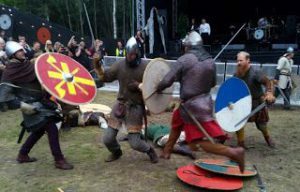 During these concerts there are different viking activities around the festival area, e.g. axe throwing, guided tours, storytelling and beer tasting. The beer tasting was probably a success because later this evening the festival was sold out of special beer, a lose-lose situation I hope we don’t get next year. It is still comfortable with space in front of the stage when Kirkebrann starts. The jerry cans on stage is almost mandatory with a band name like this. 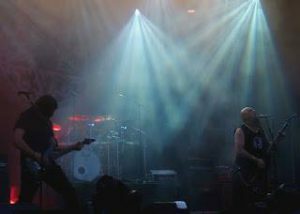 They play rather catchy black metal with repetitive riffs, and some “cheers” from the band are well responded from the audience in the sun. The sounds gets better through the short set, just like is has been for some of the other bands. No time to get bored between the concerts. 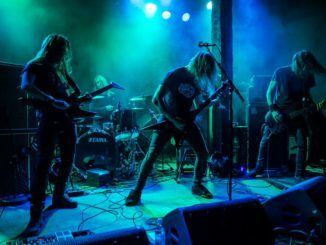 Before doom metal band Hamferd from the Faroe Islands impresses the audience, followed by Swedish viking/black metal band Månegarm, we again get viking battles. Sadly I had to skip these concerts to get time to see more of the beautiful surroundings, get a bath and something to eat. If you didn’t get enough viking show between the concerts, during Melechesh you had the opportunity to join the moshpit with both regular metal heads and vikings with helmets and chain mail. This sounds good with a touch of middle east in their music. 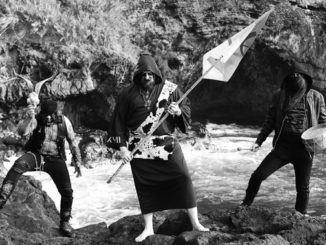 The guitarist wears a scarf concealing his face, which also gives this band a different look than the other black metal bands. Their music is catchy, so even without a viking helmet and chain mail you manage to join the moshpit for quite a while. Black metal band Tjsuder from Oslo got a brutal and dirty sound throughout their set, but this sounds good and very hard. Some of their catchy riffs actually remind me of Accept, but we don’t get a cover before they end the set with the Bathory’s Sacrifice. The audience has enjoyed the whole set from the band with the longest spikes and nails, and hardly noticed the weather. Yet. Wardruna is a nice and worthy end of a viking/metal-festival, at least the audience must have thought so because they hold on even though all of the nice weather we had had through the weekend now was compensated for with heavy rain throughout the concert. People stand still and enjoy the music and the magical atmosphere made by sound from the folk instruments, lights, the nice backdrop, and the weather. After the show the you can party on in Gildehallen with music from the metal-DJ. Midgardsblot, see you again next year. 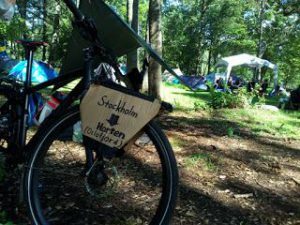 Throughout the weekend I saw a lot of beautiful viking dresses and tents, but as a hobby cyclist I noticed this at the camp, a sign saying “Stockholm-Horten” on a bike. 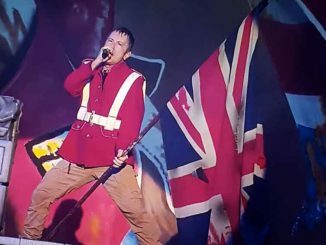 A finnish metalhead had taken the ferry across the Gulf of Bothnia and then cycled all the way from Stockholm to Midgardsblot. We had to hear what he had to say about the festival. Have you been at the festival before? -This was my first time. Which band was best at the festival? -Hard to decide, both Wardruna and Folket Bortafor Nordavinden brought the festival a very unique spririt. Which three bands would you like to see at this festival next year? 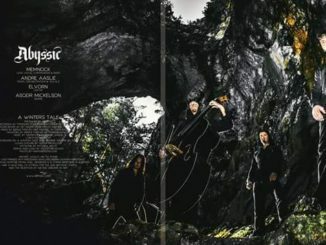 -Among the two mentioned, (finnish) Jonne Järvelä solo project, (estonian) Metsatöll, (faroese) Týr. Is there something that could be better at the festival? -Less delays in the schedule. What do you think about this festival? -I think that it has a lot of potential to become a long lasting tradition, I hope that the festival doesn’t grow too big.